My Muaythai experience and why every women should try it! At first, I am hesitant to try Muaythai because I am not sure if I can handle the training and all. I think I have a weak tolerance with pain and immune system pero I give it a try parin. It’s my second month now and I am truly happy with how muaythai and boxing helped me. My punches are getting better every session I had and yung level of confidence ko ay naiba na. Before doing the session, my trainer teach me to do the stretching first. Basic routines like, hand and foot stretching and jumping rope. That counts every three minutes. Pero I feel like ang tagal ng 3 minutes. Make sure you have handwraps just like mine. Let me share with you what Muaythai is all about and what benefits we can get from it. “Muay Thai or Thai Boxing is the national sport and cultural martial art of Thailand. It was developed several hundreds of years ago as a form of close-combat that utilizes the entire body as a weapon. It is a combat sport of Thailand that uses stand-up striking along with various clinching techniques. This physical and mental discipline which includes combat on shins is known as “the art of eight limbs” because it is characterized by the combined use of fists, elbows, knees, shins, being associated with a good physical preparation that makes a full-contact fighter very efficient”. Why I am hooked to Muaythai and what are the benefits? 1. It improves physical fitness and appearance. Truly, I feel so relaxed every after session I had. It calms down my mind and body. 3. It develops courage, determination and boost my self-confidence. Working out even at home is not that easy if you don’t have the discipline and courage to do it. It takes a lot of courage going to the boxing gym every week, some do it twice or thrice a week. After all, this is my main goal. Because of the thorough work out that Muaythai provides, working on all our limbs and gives you so much sweat, definitely I guess with continuous work out, it will help you loose weight. And because I am a work at home mom, I need to have focus in everything I do. With muaythai, it gives you focus on your goal to be physically healthy and more to life’s goal. 6. Meeting new people and make friends. Yes, there’s nothing better when we share our experiences with other people and have a grueling session with them and became friends. Not for being violent but these days which our safety is at stake with the help of muaythai, I am learning the basic of how I can escape to those hard situations and help defend myself or my children. 1. I feel more confident about myself. 2. My skin looks radiant and glowing. 3. My stress level goes down. 4. It increases my stamina and endurance. 5. I become more physically active. I do zumba at home and badminton on the side. 8. I became a good role model for my children to be physically fit and healthy. 9. Less anger and more happiness. What you need when training Muaythai? 1. Handwraps, that costs around P400.00-P450.00. Try to canvass. 2. Muaythai gloves. Muaythai gloves are to follow but if you have extra penny to have it since it is way expensive but it is recommended since you can’t afford getting infections from using same gloves that others are using. 3. Don’t forget your tumbler. 4. Extra towel and clothes. Believe me, you’ll sweat a lot. 5. Most of the gym we’ve been to, they have annual membership fee, though it is not a must but you can save some from being a member plus paying the trainer and gym use. 6. Comfortable gym out fit or if you have muaythai shorts, socks and sports bra, that’s fine. Some says, antiyaga mo? Why? Simply because it feels great and it gives a lot of benefits. Perfect “me time” that every mom should try. Expect bruises and pain. But it’s all worth your pain. I truly thank my husband for giving a lot of support and he’s the one taking care of my bulilits while I’m away for more than 3 hours. Let’s love our self more so we can also give more love to our family. It is always best to consult your Doctor if may health conditions kayo ha. 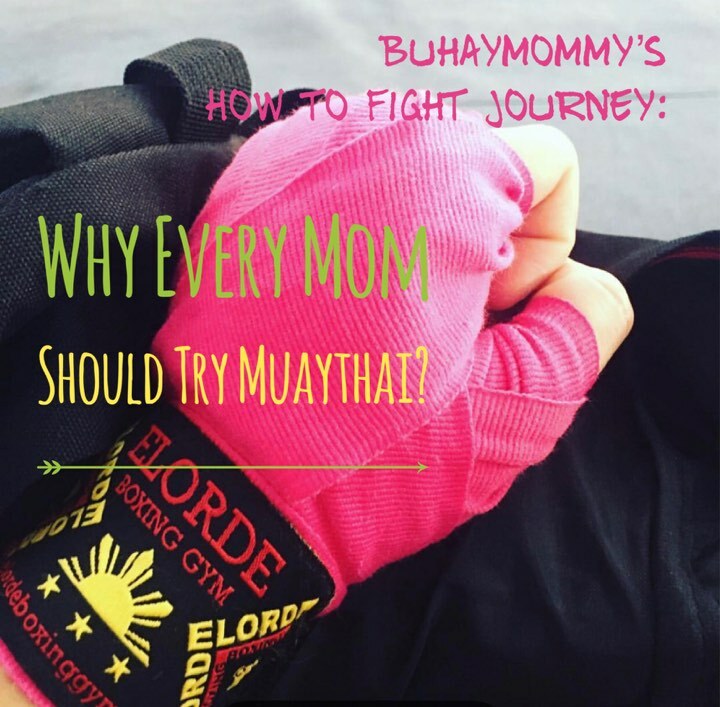 This entry was posted in Buhay Mommy Stories, BuhayMommy Reviews, Health Concerns and tagged Muaythai Benefits for Mom, Muaythai Goals for Women, Out-stream. I saw your Muai Thai pics in IG and I was like, “wow”! I don’t know if I can do that. And even though I go to the gym and do home workouts, I have never tried this one out. And I don’t even know if I can manage doing this. Pero it really is encouraging to see you doing this! There’s a Muay Thai studio near here. I want to enroll too. And maybe enroll my kids too, para sabay na kami. You look great! Love the sweat out! Wow! You look glowing after your workout (even if you’re sweaty!) And I agree with using your own gloves–my friends also took boxing classes (not muay thai), and they felt compelled to buy their own gloves because mabaho raw yung gloves na pinapahiram ng gym, hehe. Update us on your progress! Thanks Maine. Oo totoo as in hindi ko ma-take yung smell. Mahal lang talaga ang gloves eh pero worth it naman din ♥ I’m excited to share my progress as well. Wow for self defense and physical fit. I really love this kind of routine kaylangan nito ang consistency and focus and also it helps you to burn your calories. True Melina. I love the way it burns all the calories in my body and detoxification narin. Nice to read from you again. I would love to try Muaythai as well, same with boxing. Actually, I tried boxing. My husband’s brother is a trainer and I enrolled for a short stint. Unfortunately, we moved house far from him thus was not able to continue. But I agree on the benefits of enrolling in sports like Muaythai.